A gypsy prophecy pulls melancholy sandwich-maker Harold and two bewitching sisters through a star-crossed journey of love and connection. Featuring a catchy score and inventive story-telling, this darkly comic rock fable culminates during the northeast blackout of 1965. 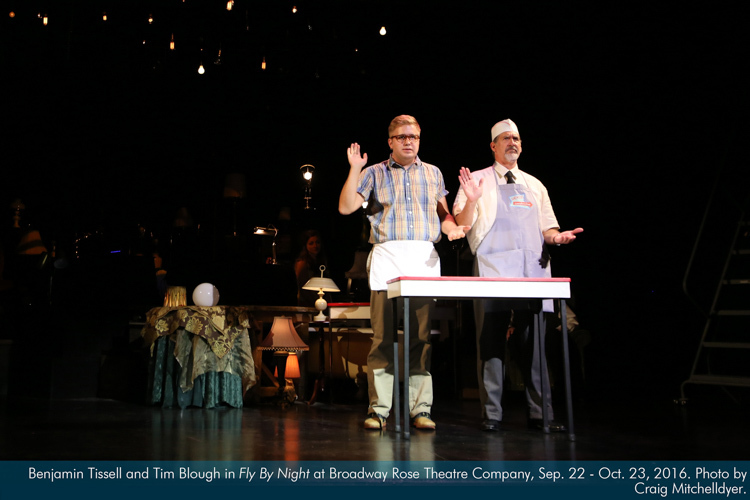 “The most paradoxical of musicals – hilarious and bittersweet, deeply immersed in tradition but utterly original” (Dallas News), Fly By Night is a tale of finding light in a world filled with darkness. 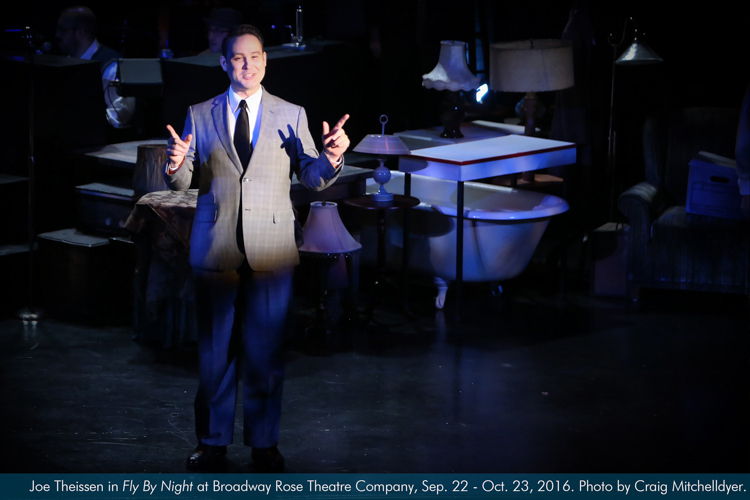 Joe Theissen (The Narrator) is excited to return to the Broadway Rose stage! He most recently appeared as Hysterium in A Funny Thing Happened on the Way to the Forum, as well as Pedro in Lakewood Theatre Company’s production of Man of La Mancha. In addition to performing, Joe is a highly regarded director, musician, and educator. Some recent credits include Heathers: The Musical (triangle productions!/Staged! ), Junie B. Jones (Oregon Children’s Theatre), Thoroughly Modern Millie (Broadway Rose), La Cage Aux Folles (Lakewood Theatre Company and Pixie Dust Productions), The Music Man (Broadway Rose), [title of show] (triangle productions! 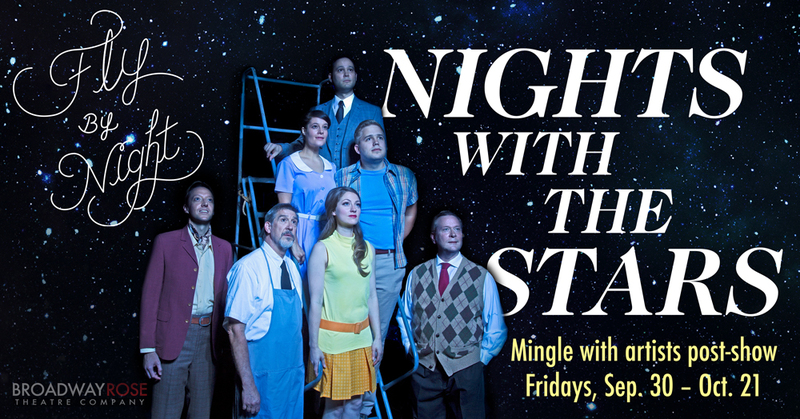 ), Beauty & The Beast (Pixie Dust Productions), and It’s a Wonderful Life (Stumptown Stages). Joe has been honored with multiple OTAS, PAMTA and Drammy awards for his work as a performer and director. As an educator, Joe has been a fixture in the Lake Oswego community over the past decade, developing curricula and programs within the L.O. schools. Benjamin Tissell (Harold McClam) was most recently seen in Peter and the Starcatcher at Portland Playhouse. 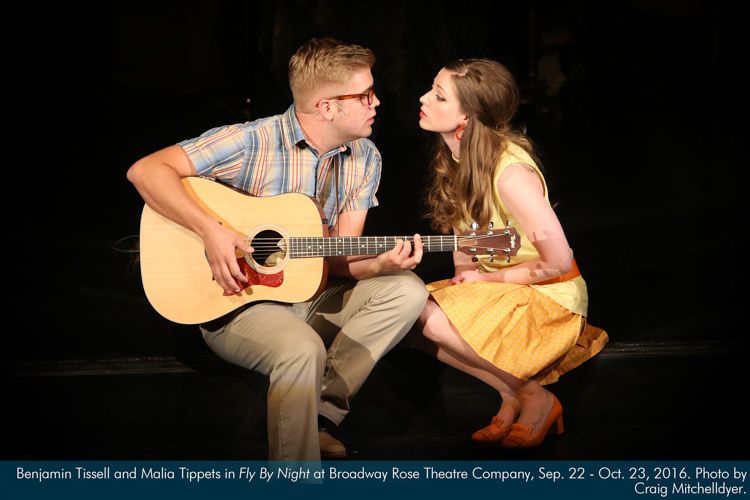 He’s delighted to make his Broadway Rose debut in Fly by Night and has also worked extensively for Lakewood Theatre, Valley Repertory Theatre, Northwest Children’s Theatre, Portland Actor’s Ensemble, and others. 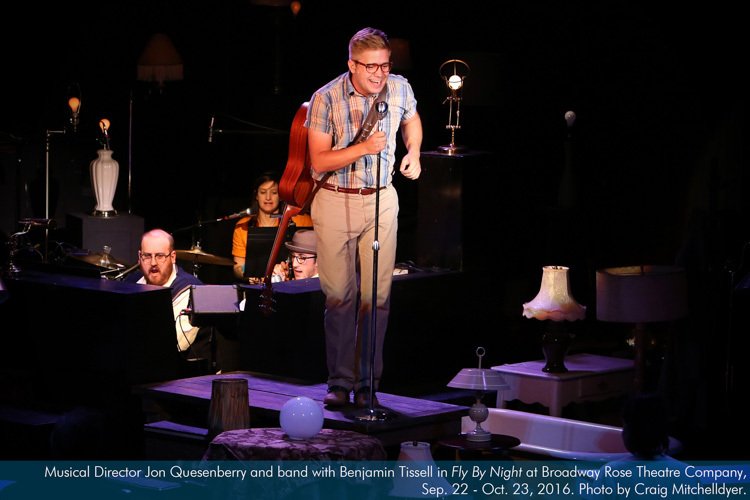 Ben is a resident teaching artist at Clackamas High School and an accomplished singer-songwriter. Recordings, videos, media and a full list of upcoming performances can be found at BenjaminTissell.com. Ben is also very involved at his church where he serves the youth community. 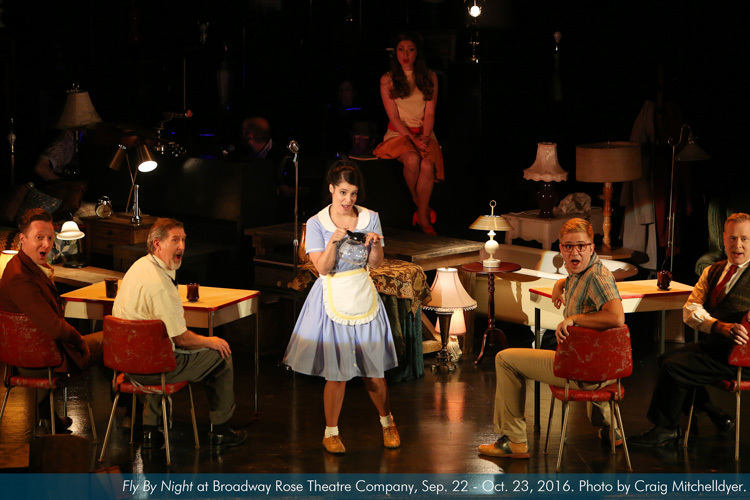 Rebecca Teran (Miriam) is home at Broadway Rose and loving it! A Portland to New York City transplant, she continues to pursue her passion for storytelling, new works, and small spaces. She has originated roles including: Erica in Carnies: The Musical (Action/Adventure Theater), Kate in Ripper (Broadway Rose), Colleen in Find Me Beside You (ManyHats Collaborations), Hester Prynne in Scarlet (PDX, MerryGoRound Playhouse/The Pitch, NYMF), Gil Dossa in The Waterman (Ars Nova), and Neil De Grasse Tyson in the reading of Molly Murphy and Neil De Grasse Tyson On Our Last Day On Earth (Playwrights Horizon). Before her return, she created the role of Maggie in The Marks You Leave (New York International Fringe Festival) written by Portland’s own Tyler Andrew Jones; she was last seen at Broadway Rose as Audrey in Little Shop Of Horrors (Drammy Award). Rebecca earned her B.F.A. in Music Theater from Shenandoah Conservatory. 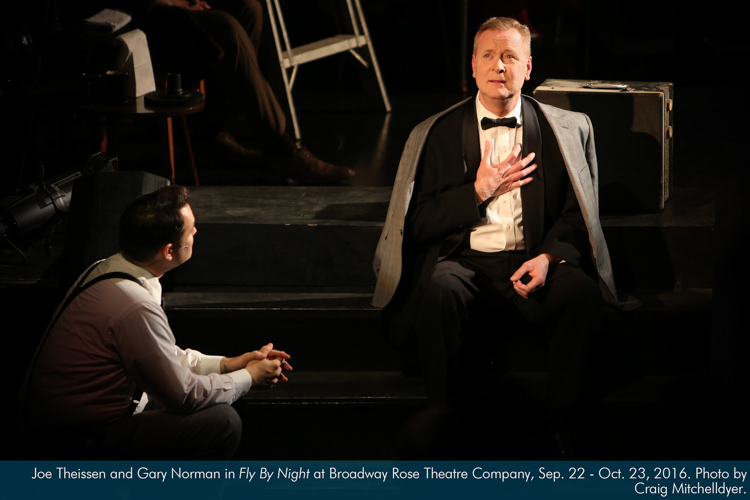 Gary Norman (Mr. McClam) is delighted to be on the Broadway Rose stage again. In his first Broadway Rose show he was the M.C. in Chicago followed by Sergeant Niell in Ripper. Most recently he was seen in Portland Center Stage’s Our Town and as Centipede in James and the Giant Peach with Oregon Children’s Theatre. He has also appeared on the small screen in guest star appearances on Grimm, Leverage and The Librarians. Gary is also a professional photographer with a focus on actor’s headshots and portraits. Tim Blough (Crabble) is a member of SAG/AFTRA as well as Actors’ Equity and has been acting professionally for over thirty years. He has appeared in more than seventy plays, plus numerous independent films, commercials, and TV credits, including TNT’s Leverage and NBC’s Grimm. He has appeared on stages in California, Florida, Idaho, Texas and Virginia. Roles include Lear in King Lear, Lopakhin in The Cherry Orchard, Bolingbroke in Richard II, Starbuck in The Rainmaker, George in Of Mice And Men and Finbar in The Weir. He has also written several plays as well directed short videos. 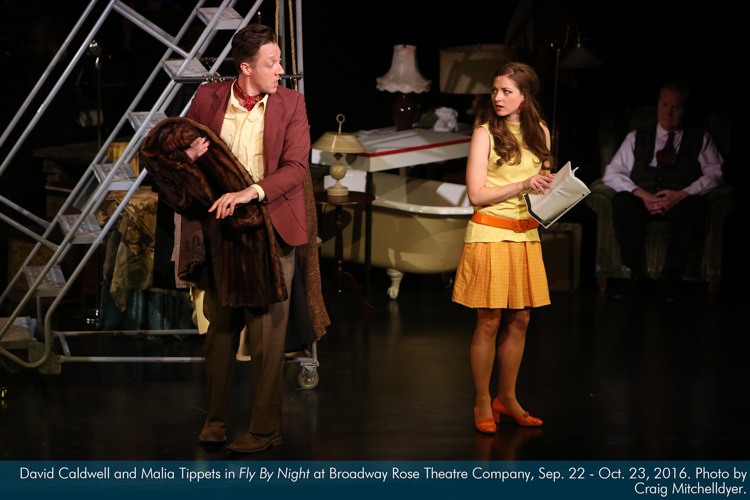 Malia Tippets (Daphne) is thrilled to be making her Broadway Rose Theatre debut in such a captivating show. Holding a degree in Theatre Performance from Marymount Manhattan College, she spent her college years performing in New York and went on to tour the nation in the mega musical Evita as Eva Peron. Returning to New York, she was featured in the “Town Hall: Rising Stars of Broadway” concert. She spent two years in Japan, performing as Elphaba in the Universal Studios production of Wicked before returning to Portland. Favorite Portland credits include Carrie: The Musical (Carrie White), Anything Goes (Hope Harcourt) and Heathers: The Musical (Veronica Sawyer). She wishes to thank her parents for their endless support and her love for making every day better. Sunday, October 16, 2:00 PM–SOLD OUT! 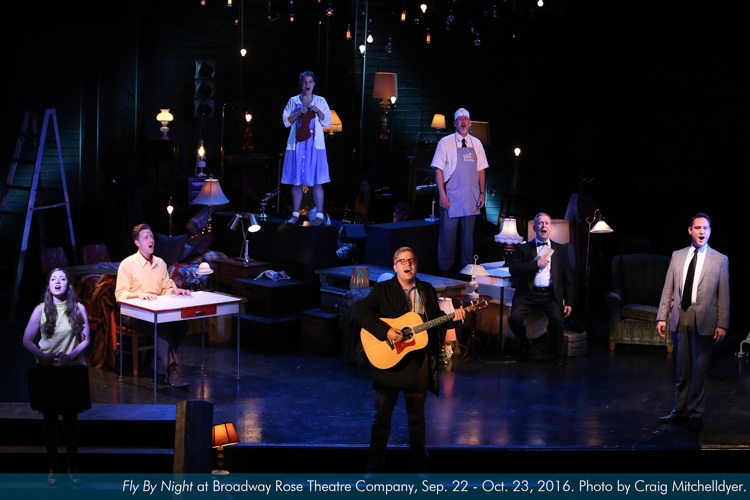 “Fly By Night” has a bright and varied score, and more importantly, the show itself represents yet another leap for Broadway Rose, the show is untraditional, a departure from the theatre’s usual fair, though not far enough to be ill-fitting... Read more. Tippets’s soulful soprano booms to new heights in Fly by Night...Teran has an equally stunning range, but with the crystal overtones that match her character’s dewy-eyed outlook. The combination of top veteran Portland vocalists rounds out and polishes Fly by Night like a late-night brandy. Read more. 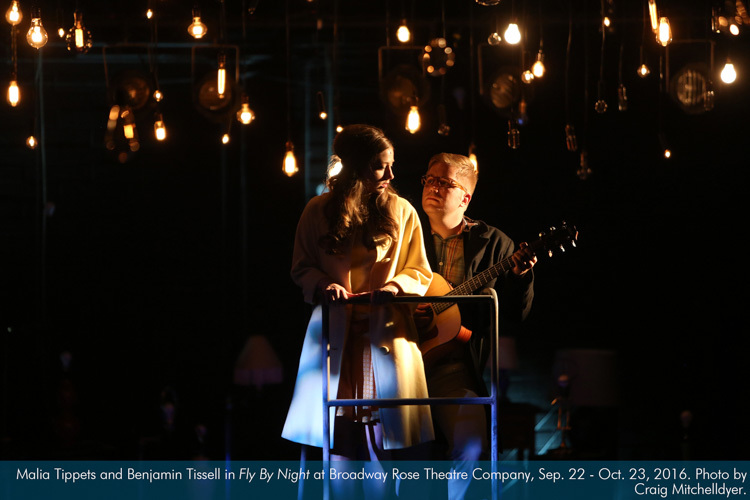 [Fly By Night] stays with you for days as you muse over the mixture of darkness and light, text and subtext, isolation and connection, simplicity and complexity that make this production so compelling and memorable. Read more. If you’re looking for that next musical to fall in love with, or you wonder what the big deal is about musical theatre, I very highly recommend you make your way out to Tigard to see Fly By Night..I honestly can’t remember the last time I was so moved by a show and a performance. Read more. 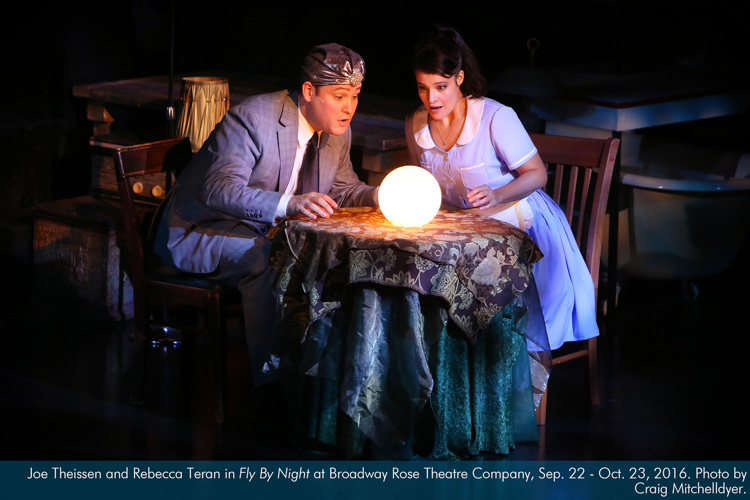 Rebecca Teran got her Portland start at Broadway Rose and returns for ‘Fly By Night’ after nearly three years in the Big Apple… “Literally everyone that I know who has seen this show says it is the best … when I read that Broadway Rose was doing it, I submitted immediately,” Teran said. Read more. “This musical is about connection,” says director Isaac Lamb. “We are all connected, though we don’t always know it or feel it…” Read more.